Home » Ye Ol’ Blog » Uncategorized » Chuck, Would you build me a banjo? Chuck, Would you build me a banjo? 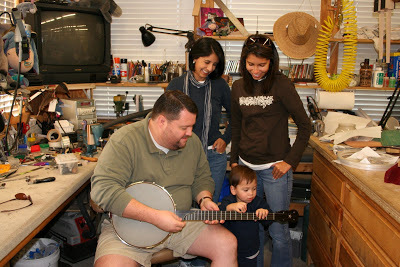 When we received a call from Dennis Moore for a custom banjo project, we didn’t know that a delightful family was involved. Dennis ordered his Custom Chuck Lee, choosing all the features, woods, scoop style, tuners and more, just as he wanted them. We were thrilled when he could pick it up in person a few months later…bringing this photo-op with him! 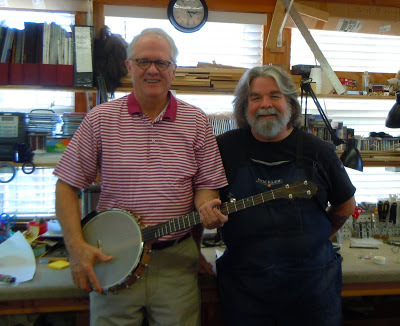 Chuck really enjoys knowing where his banjos are going and making special “one-off” projects made to order. Making each banjo as unique as the musician who plays it. Dennis Moore, shown above in our shop with his wife Sara, son Reed, and sister-in-law JoAnn. Livin’ a Dream & Makin’ the world a better place, one Chuck Lee banjo at a time. Previous post Great Deals on Martin Guitars, act quickly!